On October 6 the League of Women Voters hosted a candidate forum. Please check it out! 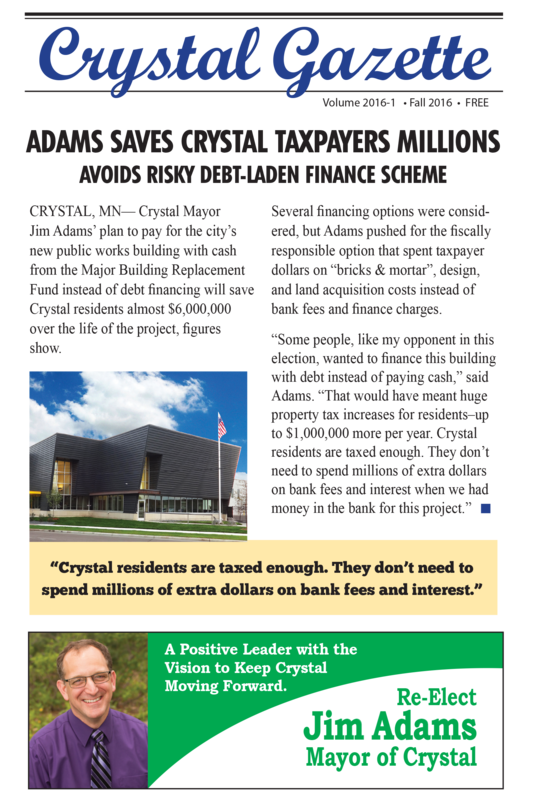 Crystal Mayor Jim Adams announced March 13 that he will be seeking re-election as Mayor of Crystal. “I ran for mayor on a platform of fiscal responsibility, building a strong community, and bringing back respect for the citizens, and in all three areas, Crystal has improved,” Adams said. Adams negotiated a solution for the purchase of the city’s new Public Works facility, which he says saved Crystal residents over one million dollars in “unnecessary” finance charges over the life of the project. Crystal Mayor Jim Adams announced today that he will be seeking re-election as Mayor of Crystal, Minnesota. Adams was initially elected in 2012. One of Adams’ major accomplishments as mayor was negotiating a fiscally responsible solution for the purchase of the new Public Works facility, which saved Crystal residents over one million dollars in unnecessary finance charges over the life of the project. 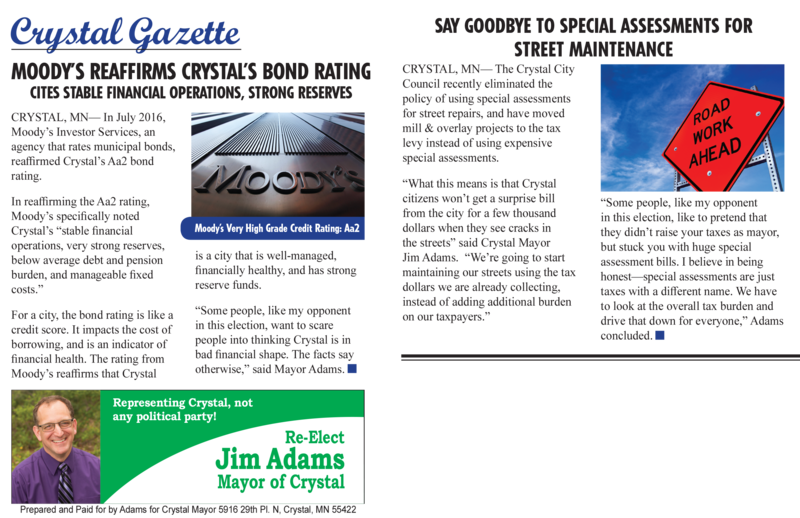 Under Adams’ leadership, the City of Crystal has made great strides in achieving more openness and transparency in government, including making audio recording of work sessions and campaign finance reports available online, and holding additional open forums and public hearings on major initiatives, going beyond the minimum that is required by law. 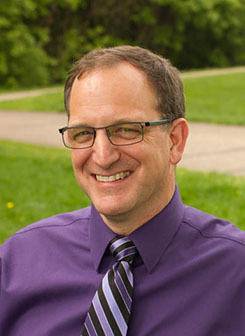 Adams’ goals for his second term would be to continue the progress that has been made toward making the city budget as transparent and fiscally responsible as possible, to continue developing a long term plan for funding infrastructure needs, and to continue to engage citizens in a respectful manner, giving them a voice in their city government. “I have been honored to serve as Mayor, and I am humbly asking citizens for another term,” Adams concluded.